HomeArticles by Matt FoxA Technical Look at Campo! 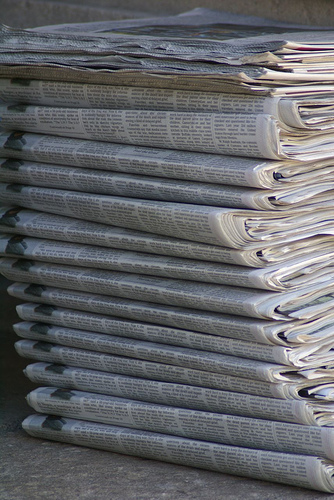 I’m pleased to welcome Bluenose Matt Fox with his first article for Joys and Sorrows. He has used his recent experience with Statsbomb to put together this brilliant analysis of Lee Camp. Recently I was lucky enough to experience Statsbomb’s Introduction to Analytics course presented expertly by James Yorke (@jair1970) and Ted Knutson (@Mixedknuts). 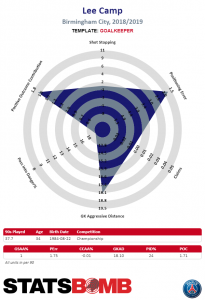 As part of the course we were granted access to the Statsbomb IQ platform, so I took the opportunity to explore the statistical output of some Birmingham City players. In pre-season, Garry Monk decided that David Stockdale and Tomasz Kuszczak would not be part of the first team squad for the 2018/19 season for reasons that are still not clear. 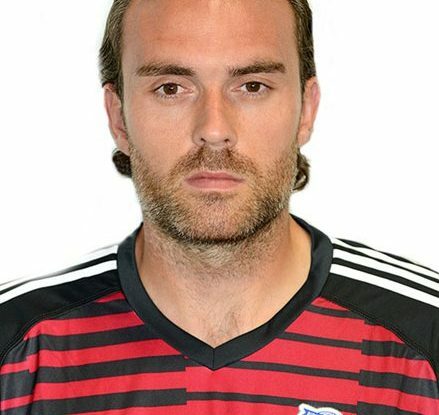 Connal Trueman started the first two games of the season before Lee Camp was brought in on a free transfer from Cardiff. This transfer was not well received by Blues fans, due to negative reviews from fans of Camp’s former clubs as well as Camp’s previous poor performances against Blues. The transfer was subject to extra scrutiny given the context that Blues were operating under EFL restrictions that only permitted 5 cheap transfers (no fees, and less than £20k per week wages) while they already had Stockdale, Kuszczak and Trueman as options for the position. Camp has been widely criticised this season, but a last minute penalty save away at QPR seems to have won him some favourability among fans, and he now even has his own chant. With only 8 games left in the season (all data is up to the 16th March, before the away game at West Brom), I have used Statsbomb data to analyse Camp’s performance so far and what direction Blues should go down at the goalkeeper position this summer. With regards to shot stopping, Lee Camp has conceded 0.79 less goals than the model would expect based on the shots he has faced. This amount is immaterial so we can conclude that Camp’s shot stopping is on a par with an average goalkeeper, which is better than some might expect considering the stick he receives from fans. His shot stopping performance seems to be in large part due to his stellar positioning, which is a clear strength. 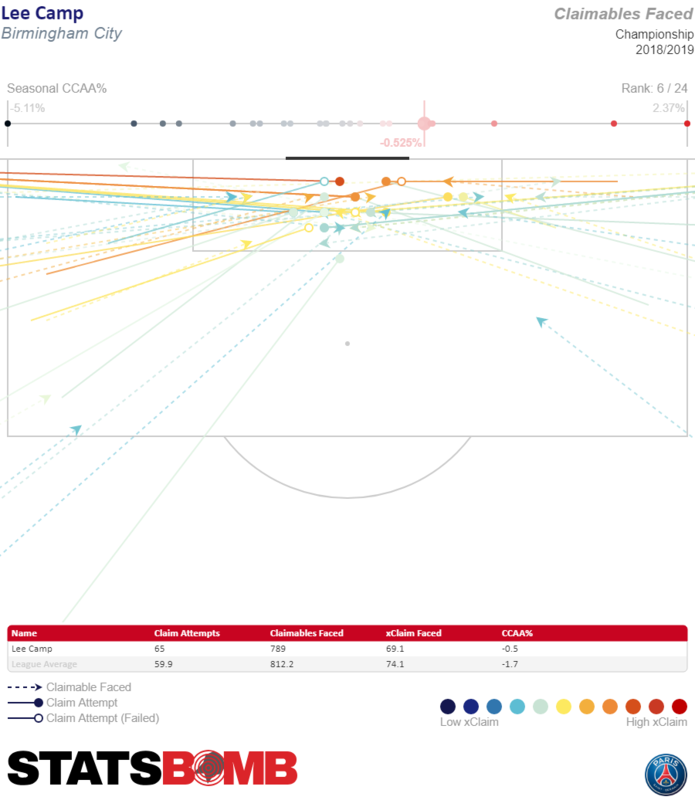 The graphic above shows the location on the goalframe of all shots on target that Camp has faced. 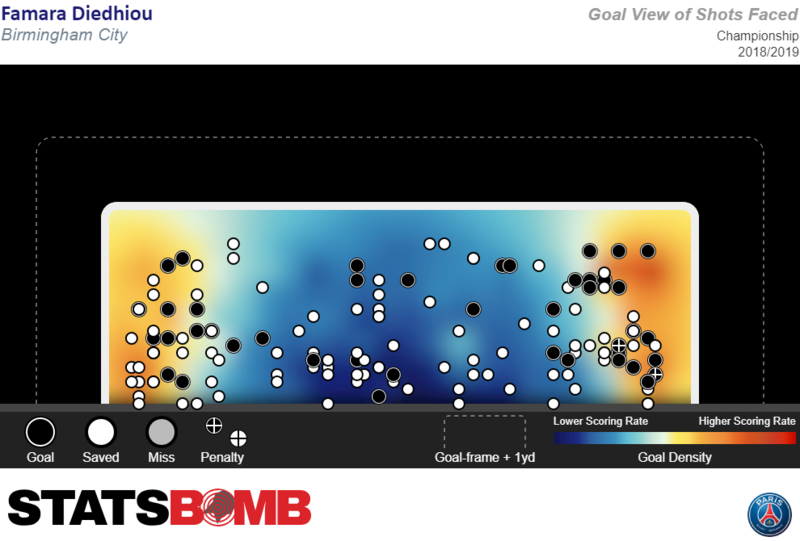 The heatmap looks to be stereotypical of most goalkeepers where shots to either side are more likely to result in goals. However, Camp seems to be slightly stronger going to his right side, as a higher proportion of shots to his left, particularly to the higher left side, result in goals. 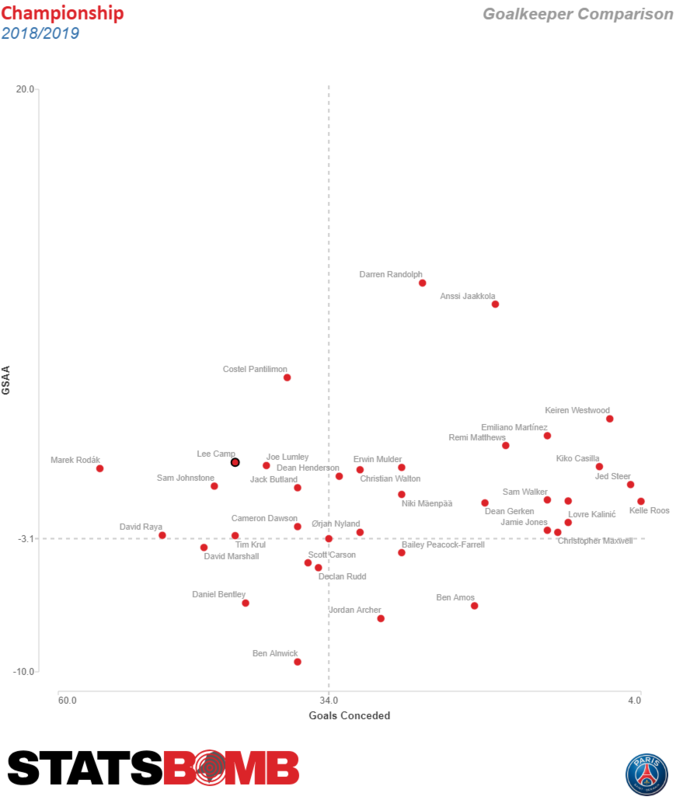 The chart above shows that apart from a few outliers (including our former goalkeeper Darren Randolph), most goalkeepers in the Championship concede about the same amount as the model would expect. So unless you can find one of the premium goalkeepers who will concede less than expected by a meaningful amount, finding a low cost option to provide average shot stopping output is a reasonable strategy. The amount of crosses and high balls into the box that Camp claims is also in line with what the model would expect an average goalkeeper to claim. This is another area that Camp receives criticism for, but Statsbomb data seems to indicate it is not much of an issue. However finding a goalkeeper who dominates the penalty area more than Camp may remedy Blues’ weakness of defending crosses (see Villa (A) and Swansea (A) where multiple goals were conceded from Blues inability to deal with crosses). Camp’s GK Aggressive Distance is quite high, showing that he has made clearances, tackles, interceptions and ball recoveries further from his goal than an average GK. This is quite surprising given the deep defensive line that the Blues backline keeps, where Camp is rarely called into action to sweep up, and often shows hesitation when he is called upon (illustrated by the Britt Assombalonga goal in the home game vs Middlesbrough). Camp’s Pass into Danger % is very high, as expected due to the large proportion of balls that he launches up to Juke who will invariably be under pressure from defenders. 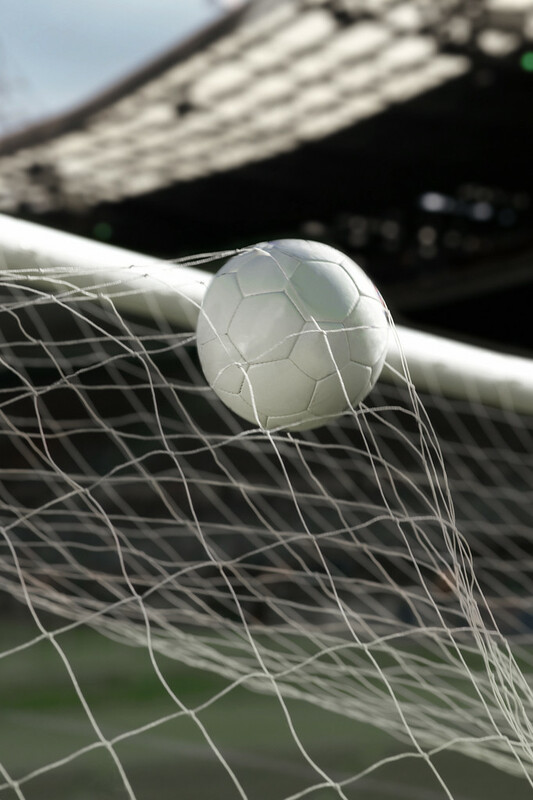 The high Positive Outcome Contribution also seems to be a result of the long balls up to the strikers that Blues are quite proficient at converting into chances. Overall, Lee Camp’s performance has been solid and he has not been the weak link that some might believe. His signing on a free transfer and low wages has represented value for money and I think Monk will be happy with how the move has worked out. However, if we factor in the wages of Stockdale and Kuszczak, Blues have been overpaying for the goalkeeper position this season in order to achieve average performance. Kuszczak is out of contract this summer but Camp and Stockdale both have a year left on their contracts. Stockdale’s reportedly big wages were a stumbling block in Blues’ attempts to offload him for the last two transfer windows and this issue may persist in the coming summer, although his value may have been helped by a couple of successful emergency loans at Wycombe and Coventry. As Monk seems insistent that Stockdale will not be a part of his plans, it would seem Blues will have to pay some of Stockdale’s wages in any prospective deal to get him out the door. Lee Camp turns 35 in August, so he does not represent a long term answer at the goalkeeper position. It would have been beneficial for Blues to give Connal Trueman (23 years old) a run of games at the end of this season to evaluate whether he can step up to the first team level, but the recent 9 point deduction means this evaluation will probably have to wait until pre-season. Blues also have other options in the academy ranks: Jake Weaver (21) has been on loan to Kidderminster Harriers and Hungerford Town, Adam Siviter (18) has had loan spells at AFC Totton and Stafford Rangers, and Zach Jeacock (17) was recently offered a 3 year contract after a string of appearances for the under-23s. 6 Comments on A Technical Look at Campo! You totally miss the point with all that waffle. Lee Camp,in a way,epitomizes Birmingham City.He is not the best and even said so before he joined us! For right or wrong,Monk decided he wanted a another keeper yet could only pay minimum wages and Camp stuck his neck out. That’s why he has a song and will forever be a bit of a cult player for us. Agreed. At least with the analysis. Not sure stats can prove relevant. 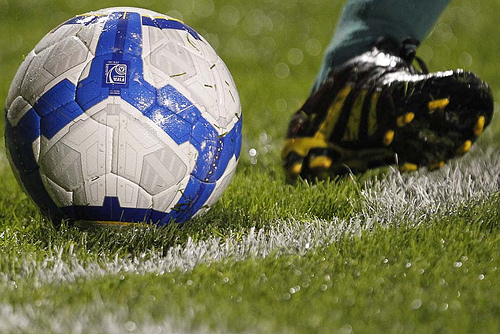 Opinion too differs as many see Camp as ok. We are paying wages to keepers we don’t want. A lot of jam roly poly? Therein lies the problem. If we weren’t paying for dead wood the stats would speak for themselves. Exactly Russ.Kieftenbelds stats will fall off the Cliff now. Does not.mean he hasn’t been our best player by a long mile. What has Monk got against Stockdale? – he should come clean on this as it has cost the club money at a time when we needed to keep our finances under control. it would have also meant we could have had another player on our books instead of Camp. Hopefully we can win another game and then start giving Trueman and other youngsters a go instead of persisting with hacks like Jota and Maghoma.